After a short flight with Vietnam Airlines departing from Hanoi in Vietnam – Robin and I (I almost feel like batman saying that...) arrive in Bangkok. Temperature is back to 30° with a clear blue cloudless sky. I am really surprised: big four lanes and impeccable motorways – sky high buildings connected by a sky train and undergound tube. Mopeds and cyclos have disapeared – leaving space to modern japanese cars, pickup trucks, bright pink / yellow taxis and Tuk Tuks. No more bumpy roads nor constant horning. Thailand is ahead of Vietnam by about 10 at the very least. We head directly to Kohsan road : backpacker's heaven. Plenty of travellers and a long street of shops, food stalls, bars, tatoo parlors and hotels. Ambiance is relaxed – street vendors are way less aggressive and can take the first « no » for an answer which is rather enjoyable. We walk a bit and find this hotel with swimming pool on the roof : 700 Baht per night for a double room. The place is decently clean and the roof terrace gives an impressive view on the giant 14 million inhabitant capital of Thailand. We head out and start exploring the street – the street is really animated. We walk around the shops and stalls, bargain for fun on fake ipods and pirate dvds sets. Then we sit down at a terrace for a fresh beer and watch people pass by. Robin had told me about and I had seen some in Vietnam : here they are called « Catois » or more commonly named transexuals. It is really funny to watch them walk around the streets and some of them can look suprisingly feminine. However there are certain give aways: the adam's apple, the joints, the muscles and square shoulders. It is recommended not to laugh at them: firstly because it is disrespectful and secondly since they are (like most men in Thailand) trained in the art of Muay Thai boxing. We get in a Burger King. This is the first time since I entered Vietnam that I can taste a good old burger – a real treat for my stomach as the beef noodle soup I had in Hanoi's airport left me in a painful and weakened state. The next day we decide to go see « Tchatutchak » week-end's market and hop on a Tuk Tuk (some kind of ong three wheels motorbike for tourist which often tries to offer a free ride to annoying and aggressive shops from which they get commission after forcing you into buying something – and when they don't take you on a shop tour, their service is expensive – pics are in the « Bangkok madness » album) to take the Skytrain. We arrive a « Siam » skytrain stop which also has bigger and even more modern shopping malls than I have ever seen (even in Singapour or Europe). Here you can find anything you want. We end up in the electronics department where numerous shops are selling all sorts of USB devices, mobile phone (original ones and replicas) and modified consoles. Prices can be interesting but without warranty or possibility of returning to the shop – any purchase becomes really hazardous. I try a « Mini I-phone » which costs about 100 euros. When switching language to French, half of the menus are still in chinese and the rest seems to have been translated by a monkey using an online translator. We hop on the sky train which is very clean, convenient and offer a great city tour for the price of mass transportation. The city is really modern and at the same time some curbs are destroyed and buildings look really derelict. We pass by the « Victory Monument » built after the victory in the second world war and finally end up in Tchatuchak area. This is a giant market with all the gadgets, clothing, local foods and other wonders one can imagine. We stop for a drink and watch people pass by before continuing our visit of the city. Then we head off to the Nana area which is the red light district of Bangkok – a very animated place with gogo bars, neon flashing lights signs and as many sexual tourists as regular city visitors (including families). The entertainement around here are « ping pong », « darts » and many other shows. This part of the city is much more lively and colorful. elephant owners walk around with elephants on leash offering to buy and give food or take a ride. The poor animals are walking in the crazy Bangkok trafic on drugs so that they don't go crazy and stay compliant. The next day we decide to go cruise on Bangkok's river which is also a great way to see the city (see the « Bangkok madness » album). Once again we are under bright blue sky, cruising for a two hours city tour with a stop at the « snake farm » (SNAKE SCARE THE S*** OUT OF ME...). After one hour cruising, we arrive at the farm: derelict animals stuck in cages – they look tired and depressed: snakes, monkeys, deers, turtles and even a tiger that which we watched ingurgitate a kilo meat and bones in about a minute. The snake show was scary as hell for me – especially when the presenter held a deadly poisonous viper by the tail and starting twirling round few meters away from us. Half the people ran off, I stood there petrified. It is always to confront one's fear, athough things have to be taken one step at a time. 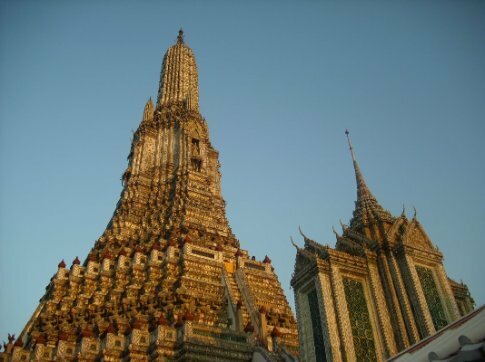 One our way back, we stopped at « Wat Arun Ratcha Wararam » a magnificent buddhist temple of which you'll be able to see pictures in my album. Near the temple we also found flowers which open when one claps his hands near them, it is very fun to watch – even flowers like applause. Je dois être un gros naze mais je trouve pas les photos ? Je ne trouve pas l'album !!! nan t'inquietes, je suis en train d'ajouter les photos - c'est du sport de tenir tout ca a jour ! Encore bravo pour ces descriptions si détaillées! on s'y croirait et ç afait vraiement envie.